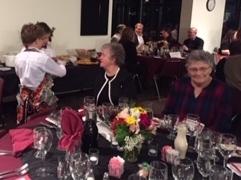 St. Joseph Catholic Parish-- Thank You For Making the Parish Dinner a Success! While it will be a few weeks before we have final results for how much was raised for a new sound system, we would like to thank everyone who attended the Parish Dinner (or provided a ticket for someone else) and helped make the event a success! We had so much fun sharing a meal, dancing, and bidding on the wonderful selection of auction items with you. We would like to thank everyone who donated an item for the auction including these local businesses: Abrusci’s Restaurant, April’s Salon, the Arvada Center, Avenue Gifts, Capital Grill, Colorado Railroad Museum, Dinosaur Ridge, Dove Inn, Gerkens Church Supply, Golden Himalaya, Golden Puzzle Room, Julianna’s Wardrobe, Miner’s Saloon, Mountain Lux Candles, Period Six Studio, Sam’s Club, and Spirits in the Wind Gallery. Each Religious Education class also put together a themed basket that were auctioned off: Preschool - Family Game Night, Kindergarten - Family Camping and Movie Night, First Grade - Garden Lovers, Second Grade - Baker’s Delight and Joy of Reading, Third Grade - Exotic Spices, Confirmation - Coffee Lovers, Tea Lovers, Chocolate Obsession, and An Italian Feast, Middle School - Mexican Fiesta, and High School - Family Movie Night. The wonderful baskets raised $749. Adult volunteers: Laura Burczyk, Beth Burczyk, Patti Reidel, Cathy Winkler, Barbara Delridge, Linda Aberle, Margaret Mooney, Shirley Klinkenfus, Virginia Durbin, Lee Durbin, Becky DeHerrara, Carolyn Horton, Jack Horton, Mimi Lowry, Tammy Cooper, Janet Ericsson, Ginny Dondelinger, Irma Schroeder, Andrea Aquino, Emily Huff, Lucy Bosch, Lucy DeVitt, Mettet Karpinski, Meredith Langie, Jane Ambro, Elizabeth Dehm, Dan Walsh, Alex Nastick, Christa Dierking, Chad Dierking, Oscar Gutierrez, Stephanie Slowinski, Cody Brokmeyer, Gail Brokmeyer, Stephanie Bentancourt, Stacey Paulson, Grace Krupa, Jeremiah Torbit, Andrew Trujillo, Mary Trujillo, John Anderson, Norma Anderson, Jill Giovannetti, Luca Giovannetti, Ella Giovannetti, Adiya Robbins, and Declan Robbins. Youth volunteers: Jeffrey Karpinski, Bennett Langie, Anessa Peterson, Lanie Medlin, Olivia Langie, Hunter Winkler, DeMarcos Marquez, Oliver DeVito, Hailey Grabbe, Samuel Grabbe, Cody Medlin, Luz Casillas, Landon Aquino, Edgar Casillas, Louisa Kellstrom, Galena Sheehan, Ethan Sheehan, Madeline Dehm, John Emerson, Daniel Trujillo, Bella Marquardt, Sophia Slowinski, Lincoln Walsh, Isabel Baitis, Alma Gutierrez, Ani Napuli, Nia Napuli, Adiya Robbins, Declan Robbins, Sarah Banks, Josh Dierking, Valeska Trujillo, Giulia DeMin, Max Trujillo, Alex Osborne, Polly Ambro, Wyatt Brokmeyer, Lilly Miller, Dylan Paulson, Carrick DeMin, Brody Betancourt, Lauryn Mackey.